Cleveland Area History: Granville, Ohio, in the 1830s - Two Views or Two Copies of the Same View? An impressive analysis. These two images, so similar yet with significant differences, also open up the question of how trustworthy these types of documents are in faithfully recording the appearance of a building. In a restoration this could be crucial; let's say, for example, the one-window gable was correct. If only the other picture survived, they might destroy the original feature and "restore" the imaginary two-window version. Indeed! This is why I'm so interested in gathering as large a body of visual material relating to Ohio as I can - so that the images may be compared with each other and with evidence in other media. I am piggybacking this post to add to the family information. Edward Lewis was the brother of William Lewis and all, including Mary Ann, were born in Malmesbury Wiltshire. In fact there was a large Ex-pat Malmesbury community (just do a search at the Necrology to see how many). Many of the Lewis family emigrated to Cleveland with one going on to Iowa but the rest stayed close to Cleveland. to have died of Cholera, so unlike so many of his nephews he didn't get into the oil business. Gardner is Market Gardener, growing food for people not crops for animals. I'm wondering the source of the lithograph being dated 1835-9? 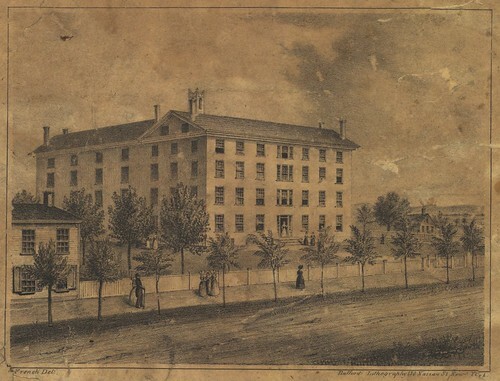 when I read the Wiki referenced chapter on the Baptist then Episcopal then Baptist again Young Ladies' Institute, which (if I understood correctly) later became the Granville Female College, it mentions the building acquiring a 4th floor in 1861. did you happen to look at that book? I can't see the lithograph well but I would guess the drawing was done by a young person- particularly because the doorway figure is done so crudely. does Ohio's State Historic Preservation office have a photo database of demolished historic properties? 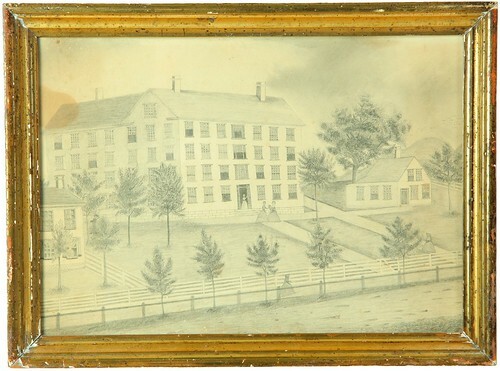 have you contacted the Ohio Historical Society to see if they have other published/print images of the College? p.s. re Parnassus' comment re: restoration,it's true that early building images can reveal the architectural history of a building, but remember that carpenters/ restoration professionals can also read that history in structural elements - both in plain sight and also hidden in walls, attics, cellars...Placement of former windows, doors, staircases are some of the most obvious examples. Mindy - I didn't look at that book. I'm pretty sure that the date given in the catalog record from the American Antiquarian Society was based on the dates that the printer in question was active - but I'll check. The image from Howe's "Historical Collections of Ohio" wasn't included in the auction listing at the time I wrote the article. Looking at the original image, from the 1847/48 edition of Howe, it appears to be one of the many images that he copied after another source - the style appears inconsistent with his work. That's only to say that I'm not entirely confident in it as an indicator of the late 1840s as a date. Another idea - it was very common for self taught artists (or those who trying to be artistic) to copy known works. Go through most any thrift store or antique mall and you will very likely see art made with the best of intentions - some are very good copies of known works, and others not so good. At a time when people had no evening entertainments that we enjoy, and books were rare (and reading thought to be selfish and lazy by those who couldn't read and didn't want others around them reading as well), this types of homemade art flourished and were based on what people either had on the wall or had seen on a wall. My guess is that the top picture is based on the lower picture and done by someone who's talent had yet to fully blossom.